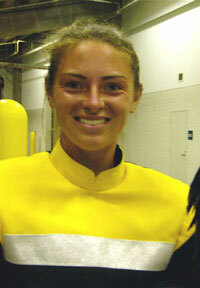 Following her performance in Atlanta, Ga. on Saturday, July 14, 21-year-old Southwind mellophone player, Marie Lauten, talked with DCI.org's Christina Mavroudis about the corps' 2007 season, and what it is like to be a five-year veteran of the corps. CM: How did you first get involved in drum corps? ML: One of my friends from high school was a member of Southwind, and one day I decided to check it out. I'd never seen a drum corps show, and I didn't know anything about drum corps, but I liked marching band a lot so that's where I got my start. CM: How has the experience been after doing this for five years? ML: When I first started, I totally fell in love with the people and their hospitality here, and that has never changed; everyone has always been so great. The people here is what keeps me coming back every year. CM: Do you think you have made any lifelong friendships while being here? ML: Definitely. Some of my best friends that I know I will have forever are marching with me right now. I also was able to recruit some of my friends from high school. CM: Is it hard to go from the drum corps field back to the real world? ML: Yes, there's a very different atmosphere here in drum corps. It's a weird feeling to leave the drum corps lifestyle of always having something to do and following such a strict routine, to going home and being bored all the time. CM: How has your summer tour been so far? ML: A few days ago our air conditioning broke on the horn bus, but it actually got fixed today. I think we're very lucky it got fixed before we got to Texas. Other than that, tour has been great. CM: Do other members of the corps look up to you since you have been here for five years? ML: A lot of people come to me when they're feeling down. I'm always the one that's smiling all the time, so I do my best to cheer them up. CM: What do you tell them? ML: Something we say to others at Southwind is that there's always going to be that day when you want to go home, but you need to know that everyone else is going through the same thing, and that we are a family here. I tell them that this is going to be the best summer of their life, and it usually is.